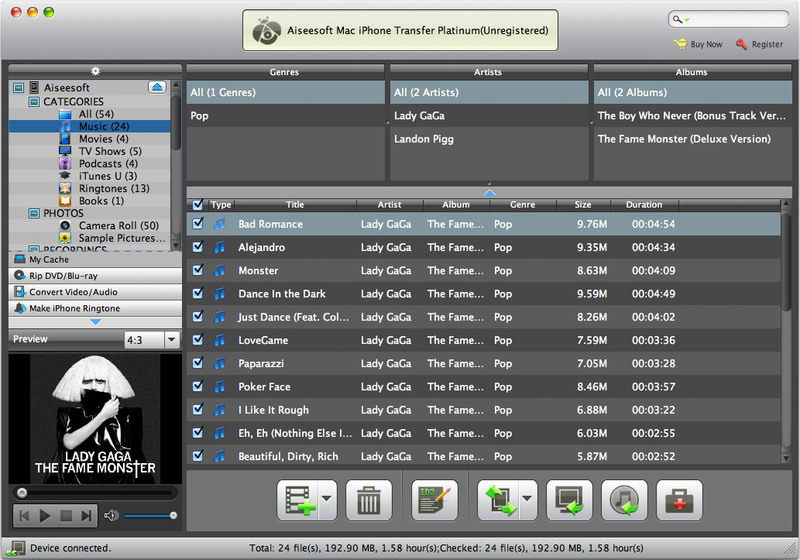 Aiseesoft Mac iPhone Transfer Platinum is an all-in-one tool for iPhone users to transfer music, video, ePub, PDF, and image files from Mac to iPhone, and backup iPhone music, movie, eBooks, pictures, TV shows, Podcast, iTunes U, Camera Roll, voice memos, camera shot, SMS, and Contacts to Mac without losing anything. It can even copy iPhone files to iTunes. Also it can convert any DVD/video/audio to iPhone, then transfer them to iPhone directly. You can also convert your DVD, video and audio files to iPhone M4R ringtones. Once you connect your iPhone to Mac, this transfer can identify your device information automatically. The search function can help you quickly find your files by the category of Name/Album/ Artist/ Genre. Without connecting iPhone to Mac, you can convert Blu-ray, DVD and video files to My Cache first. And you can transfer the output files from My Cache to iPhone whenever you want. Qweas is providing links to Aiseesoft iPhone Transfer Platinum for Mac OS X 6.1.20 as a courtesy, and makes no representations regarding Aiseesoft iPhone Transfer Platinum for Mac OS X or any other applications or any information related thereto. Any questions, complaints or claims regarding this application Aiseesoft iPhone Transfer Platinum for Mac OS X 6.1.20 must be directed to the appropriate software vendor. You may click the publisher link of Aiseesoft iPhone Transfer Platinum for Mac OS X on the top of this page to get more details about the vendor.